For 57 minutes, the 49ers played the better game. But they fell victim to one of Aaron Rodgers’ vintage game-winning drives, allowing 10 points in the final minutes to squander an opportunity for a marquee win. Here are four thoughts from San Francisco’s gut-wrenching loss. The 49ers’ 2017 season was marred with close losses. They lost five straight games by three points or fewer. The inability to close out tight games exposes San Francisco’s youth. The difference today: the other side had Rodgers. 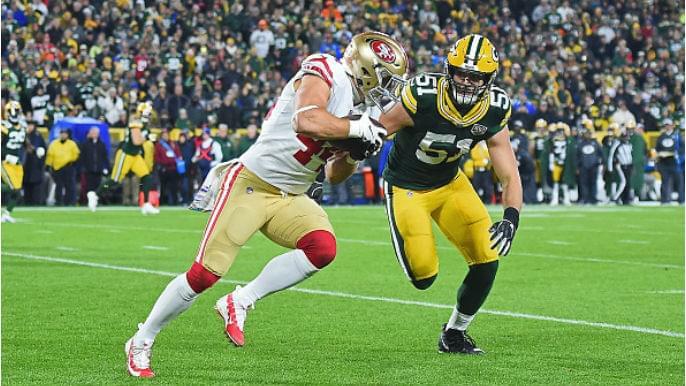 The 49ers held the seven-point lead with two minutes remaining, but Rodgers used four plays to march 58 yards, resulting in a Davante Adams touchdown. Even then, the 49ers had the ball at their own 47-yard line, after a late hit penalty against Green Bay, with 1:55 left and all three timeouts. But the drive resulted in an interception on a deep pass intended for Marquise Goodwin. The Packers got the ball back on their own 10-yard line with 64 seconds left — and still won. On third down, DeForest Buckner sacked Rodgers, but Richard Sherman was flagged for illegal hands to the face to continue the drive. One play later, Rodgers scrambled for 21 yards. The next three pass plays resulted in 51 combined yards, and Packers kicker Mason Crosby made the chip shot for the win. The 49ers have to find ways to win these close games without Jimmy Garoppolo. They have to find ways to make just one or two more plays, or avoid an untimely penalty, to emerge on the right side. Two weeks ago, they lost by two points at the Los Angeles Chargers, another good team. Monday night had all the makings of a massive win, with few people expecting the 49ers to prevail, and their playoff hopes slipping away. They now sit at 1-5. Beathard played better than Rodgers for the majority of the game. When it mattered most, however, Rodgers prevailed, as he typically does, and Beathard wilted. Monday night provided the recipe for Beathard’s success. He attempted 23 throws one week after attempting 54. The 49ers relied on their run game, which set up the play-action. Beathard surveyed his progressions much quicker. When he saw the open target, he hit it without thinking. On a third and long in the second quarter, Beathard picked up the first down by scrambling when none of his receiving options were available. The biggest play of the game featured Beathard putting a perfect throw on Goodwin for a 67-yard touchdown late in the first quarter. Beathard and the 49ers offense moved the ball well for three-plus quarters. He completed 16 of 23 attempts for 245 yards with two touchdowns and an interception, adding three rushes for 21 yards. Beathard played well enough to give the 49ers a chance, but he failed to make one or two more plays in crunch time to secure the win. As the game wore on, he struggled. The 49ers missed some vital opportunities late that contributed to the loss. Beathard missed a wide open George Kittle on third down in the red zone, which would have extended the drive, milked the clock, and put San Francisco in position to score a touchdown and seal the game. The 49ers settled for a field goal, which was the last of their scoring. On their final offensive drive, the 49ers opted for three straight passes, despite the success they had on the ground. On third and four, Beathard threw an interception intended for Goodwin, putting the ball in Rodgers’ hands, and setting up Green Bay’s game-winning drive. The long touchdown to Goodwin was unavailable last week, as he sat out with hamstring and quadriceps injuries. Kyle Shanahan has consistently said how defenses play the 49ers differently depending on Goodwin’s availability. Even if he’s not catching passes, the threat of his world-class speed opens up the entire field. There is not a cornerback in the league who can run stride for stride with Goodwin, who torched the coverage on that 67-yard touchdown. But he has also improved as an all-round receiver. He’s no longer just a burner. On his second touchdown, a 30-yarder in the second quarter, he put Packers cornerback Tramon Williams in a spin cycle before hauling in the easy touchdown grab. Goodwin may be San Francisco’s most important offensive player. But he isn’t the only one with top-end speed. Matt Breida, who ran a 4.38 40-yard dash last year, entered Monday leading the NFL with 7.6 yards per carry. He was doubtful to play earlier this week after spraining his ankle in Week 5, but he played and made a big difference. He carried the ball 14 times for 61 yards with a touchdown. One of the Shanahan’s noteworthy personnel decisions of the night: playing Raheem Mostert ahead of Alfred Morris as the No. 2 running back. They are immensely different players. Mostert, mostly known as a special teams gunner, ran a 4.28 40-yard dash at his pro day. He entered Monday with just 13 career carries through three career seasons. Morris is steady and reliable, but he doesn’t hit holes with the same speed as Mostert, who ripped off a 26-yard run in the second quarter. He rushed 12 times for 87 yards. Combine those skill players with Kittle and fullback Kyle Juszczyk, two of the most athletic players in the NFL at their respective positions, and the 49ers boasted plenty of speed across the field. That enabled their productive offensive night. It looked to be a long, miserable night for the 49ers defense after allowing 17 points and 194 yards in the first quarter. The Packers needed just four plays and 102 seconds to score their first touchdown. They added a field goal and another touchdown on the ensuing two drives. Green Bay’s play-action and misdirection killed San Francisco. When the second quarter started, the 49ers defense improved in just about every facet. Defensive coordinator Robert Saleh started dialing up more blitzes, and the pressure affected Rodgers. The coverage was better. There were missed tackles, one of the issues plaguing the defense all year, but the 49ers flew to the ball with multiple defenders to thwart big plays. After the first three scoring drives, the 49ers held the Packers to just six points on the following seven drives. One of Green Bay’s field goals during that period came after San Francisco fumbled and gave the Packers favorable field position. On a crucial fourth and three, with fewer than eight minutes remaining in the game, the 49ers blitzed Rodgers. He threw to K’Waun Williams side, and he forced the incompletion with stingy coverage. These were the plays the 49ers had not made earlier in the season. They forced a punt on the ensuing drive. Then Rodgers and company struck back. They moved the ball 58 yards in four plays, resulting in Adams’ second touchdown of the day, tying the score at 30 apiece. Sherman’s penalty extended Green Bay’s final drive. Rodgers took advantage, targeting Adams on the left side of the field, and led the Packers to the comeback win.